During the last weeks the RAP team has been busy lifting RAP’s client-to-server communication to the JSON protocol. That was a lot of work, and we finished it just in time for Kepler M2. With this milestone, the migration to the new protocol is eventually complete. 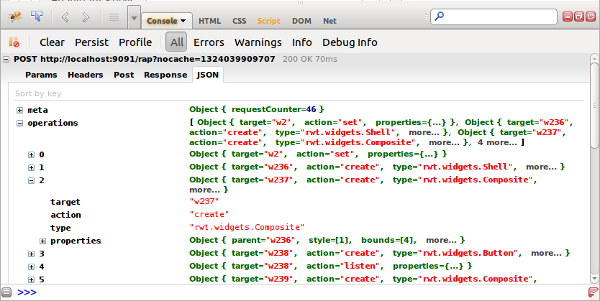 All communication uses JSON now, and no undocumented HTTP parameters are involved anymore. In RAP 1.5, we replaced the communication between server and client with a new, documented JSON-based format. Now, the client uses the same format to report changes to the server. See the new and noteworthy for a complete list of changes and bug fixes in 2.0 M2. The milestone build is available on our download site and in the Kepler repository. If you’re migrating from RAP 1.x, please also check out our RAP 2.0 migration guide. Ralf is a software engineer with a history as Eclipse committer and project lead. Ralf holds a Master's degree from the University of Tübingen.